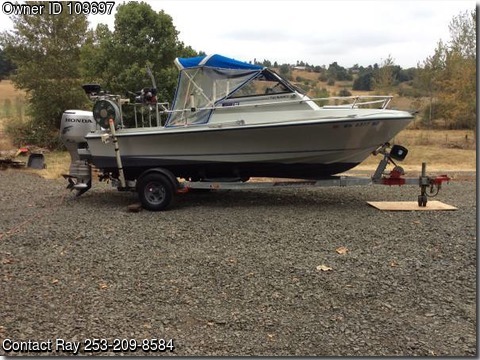 Please call owner Ray at 253-209-8584. EXCELLENT CONDITION, includes Newer Honda 115hp Engine with Stainless Steel Prop, Hydraulic Steering, and Power Tilt & Trim, plus an 8hp Honda Kicker. Garmin GPS Fishfinder new in 2011, and two other Fish Finders, VHS Radio, New Seats in 2013 hardly used, Sleeps Four, Lots of Storage, 2'x3' Fish Box, Full Canvas Enclosure, 2 Electric Scotty Downriggers, 2 Anchors, Coast Guard Safety Equipped, Dual Batteries w/Switch, 4 Weighted Crab Pots, Gas Powered Crab Pot Puller, 400ft Leaded Line, Buoys, Flags, Matching Trailer with Electric Winch. Perfect boat for OCEAN, LARGE LAKE, or BIG RIVER. Original Owner Boat has always been Covered or Dry Storage, & Professionally Maintained. Deep V Hull, One of the Toughest Boats in the Northwest with Double Hull Fiberglass Construction.